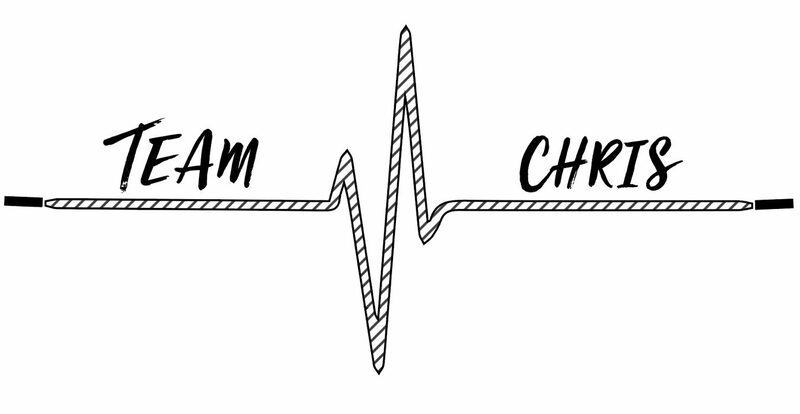 It is the mission of Team Chris to blow the cover of the silent killer (heart disease). This initiative will be accomplished by funding life-saving research and emphasizing the importance of living a heart healthy lifestyle. My name is Christopher J. Sadler and I am a heart failure survivor. October 5th, 2007 was a day that changed everything. It’s a day that I will remember for the rest of my life. I’ve grown to describe this feeling as “fading in and out of consciousness.” For a few seconds I was in complete tunnel vision and then I would return back to having full sensation. Not knowing what it was, I headed into school thinking nothing of it. I thought that maybe it was a result of not getting enough sleep or that I hadn’t fully woken up yet. During both A and B blocks, the same sensation happened again very infrequently. During C block, the sensation episodes started to last longer and became more severe. This was the first point during the day that I started to become worried that something was seriously wrong. Eventually, I asked my teacher if I could go see the nurse whose office was on the complete other side of the school from where I was. During that whole walk, it felt like I was in the twilight zone. When I got to the nurse’s office, there was another person being seen before me. As I sat down to wait my turn, I was sick to my stomach with anxiety. When it was my turn to be seen, the nurse asked me what brought me down to her office. I told her about the episodes that I was having and that they had never happened to me before. Immediately, she wanted to check my pulse and heart rate. My pulse was barely existent and my heart rate reading was high. By the look in her eyes after taking those measurements, I could tell that something was very wrong. She calmly instructed me to go to the back room and to lay down in one of the beds. About five minutes later, the Assistant Principal came up to see how I was doing. When she walked into the room to check on me, I could see that she had a walkie-talkie attached to her hip. The walkie-talkie beeped and all I heard was, “The ambulance is out back by the rear entrance to the high school.” With panic in my eyes, I sat right up and told the nurse, “no no no, it’s not that serious.” She instructed me to lay right back down and relax. By the time the EMT’s had come into my room, my Mom followed right behind. The EMT’s then loaded me on a stretcher and started to wheel me to the ambulance. In the ambulance they put in a couple of IV’s and the shock pads on me just in case. When we arrived at South Shore Hospital, they rushed me right into the emergency room and tried to rip off my Wes Welker jersey. I gave them some pushback since it was my favorite jersey and told them that they needed to find a way to get it off me without ripping it. After attaching me to numerous monitors and running a plethora of tests, they quickly realized that my condition was too critical and that I needed to be transferred to Boston Children’s Hospital. As we waited for all of the transfer papers to process, My Mom had the daunting task of calling the entire family to try to tell them exactly what was going on. We didn’t have any answers other than that my pulse was really low and heart rate was astronomically high, around 220 BPM. Here she was, with no answers as her son was fighting for his life in a hospital bed. She told them that they were still trying to get some more answers but that they needed to come now because it was very serious. At the time, My dad and one sister were in New York, one brother was in Cleveland, my other brother was in North Attleboro, and my other sister was local. When I was transferred to Boston Children’s Hospital, I was rushed to the Cardiac Intensive Care Unit (CICU) where I was greeted by a team of a dozen doctors and nurses. They asked me to explain what was going on in my own words and how I was feeling. Their first determination based on the medical information they received and collected was that I needed to go to the cath lab to determine the extent of the issue. My final memory of October 5th, 2007 was a special moment that I had with my Mom and sister. As I was being wheeled in for an emergency cath procedure, we looked at one another, embraced, and then started to cry. My mom told me that everything was going to be okay and that we were going to get through this. It’s a moment that I’ll never forget for the rest of my life. As the operating room doors closed, I learned later that there was some uncertainty that I would even survive the surgery. Everything was in the balance. Later on, the surgeon came out to give my family the news that I had survived the surgery. Over the next couple of hours, everyone else in my family had arrived to be with me. When I woke up the next morning, the room seemed like a cockpit of an airplane. There was a bed, a small TV hanging in front of me, and a massive panel of machines and monitors behind me. With all of the wires that were attached to me, there was a monitor alarm going off just about every few seconds. My Mom had stayed right in my room overnight, sleeping in the back of the room where there was a small window seat that was converted into a makeshift bed. Over the next few days, some answers started to trickle in. They determined that I had heart failure, and that I would be placed on the heart transplant list. They had the heart assist machine on standby. The medicines that they had put me on seemed to be helping. After a more few days, they needed to do another surgery to install a Pacemaker/Defibrillator to support my existing heart. The full name of the condition I was diagnosed with was: Dilated Cardiomyopathy w/ Severe Arrhythmia, and Heart Failure. After my surgery to install the ICD Pacemaker/Defibrillator, there was a lot of downtime. I needed to recover from the event and surgery. They also needed to continue to figure out which medicines would be most effective in improving my heart function, which was hovering around 9 percent. Laying in the hospital bed as a bedridden heart failure patient allowed me to slow down and to try to process everything that had just happened to me. There were still so many outstanding questions, including the big question of “Why?”. As my heart function began to improve over time, the doctors thought it would be a good idea for me to try to get up and walk around the unit. It felt like I had to relearn how to walk again. I was unsteady on my feet and required my Mom and a nurse to hold onto me to keep me upright. On one of my first walks, I received my first dose of perspective, arguably the most powerful medicine that there is. In the room right next door to me in the Cardiac Intensive Care Unit was a toddler named Jackson, who was waiting for a heart transplant. Seeing Jackson in the same position as me made me think about my life. I immediately became grateful for being 17 years old, believing that over time I’d be able to continue to mentally process my condition. I was starting to come to terms with the fact that my life going forward was going to be drastically different than how I had originally envisioned. After seeing Jackson, I made the decision right then and there that I would never openly complain to others about my illness. Perspective taught me never to complain since there is someone out there who is going through something similar or worse than you. In Jackson’s situation, I felt bad for him and his family because his childhood was going to be significantly altered. The hope would have been for Jackson to be able to experience his childhood free of sickness and pain. When I was moved from the CICU to the regular cardiac floor, there was no airplane cockpit behind me anymore. I developed my own personal life motto in the hospital which was, “Do What You Gotta Do.” When the nurses would come in every few hours in the middle of the night, they would wake me up and ask me if it was okay if they checked my vital signs. They made it seem like I had some sort of choice or something. Here I was, attached to all sorts of monitors and I’ve got a nurse standing right over me with a blood pressure cuff and a thermometer. By default, the answer just became, “Do What You Gotta Do.” The lesson here is to control what you can control and leave the rest to fate. Don’t waste your time on fighting things that will inevitably happen. Since the beeping and nurse’s visits became a little less frequent, my hope was that I’d be able to get some peace and quiet. One of the first days that I was in my new room, I had finally dozed off to take an afternoon nap. My Mom saw that I had fallen asleep and knew that the nurses were due to come in at any moment to check my vital signs. She took it upon herself to make a Do Not Disturb sign and proceeded to tape it to the door. When a nurse tried to come into the room, my Mom flagged her down from across the room and waved her to leave the room so I could get some rest. Thankfully, they let me sleep for a little bit longer. One of my favorite memories in the hospital was when Wes Welker gave me a phone call. I was taking a nap when the hospital phone rang, which it never did. My sister was taking a shift to sit with me and she picked up the phone. She woke me up and told me that I had a phone call. Because I just woke up and was still groggy, I told her to take a message and I’d call the person back later. She insisted that I take the call right away. Reluctantly, I took the phone call. On the other end was New England Patriots Wide Receiver Wes Welker. Wes asked me how I was doing and told me that he’d heard a little bit of my story. I didn’t really feel like talking about myself so I began to ask him if he was ready for the Patriots v Cowboys game on Sunday. On Sunday, October 14th, 2007, The New England Patriots beat the Dallas Cowboys 48-27. Wes caught 11 passes for 124 yards and two touchdowns. After several surgeries and too much time in the hospital, I was finally able to go home. It was a real challenge to transition from being in the hospital to being home. I was taking a variety of medicine throughout the day and night. I slowly began to reintegrate myself back into the life I built for myself at home. I’ve had plenty of time to ponder the important questions of life and wrestle with the question of why this happened to me. The way the answer has presented itself to me is that this happened because something bigger than myself knew that I was capable and strong enough to handle it. They believed that I could handle it and also learn something valuable from it that could be shared with others. It’s became part of my mission to step back and think about how I can take my situation and make good from it. How am I going to be a productive member of society? How am I going to thrive? How am I going to make a difference in the world? My path has led me to the American Heart Association. The American Heart Association is a non-profit organization that “funds innovative research, fight for stronger public health policies, and provide critical tools and information to save and improve lives.” Their end goal is described in their mission statement, “To build healthier lives, free of cardiovascular disease and stroke.” By becoming involved with the American Heart Association, it makes feel that I’m doing something right and just. To celebrate my ten year heart anniversary, I created Team Chris to walk in the 2017 Boston Heart Walk. Walking has become one of my greatest passions and it allows me to maintain a healthy lifestyle. it has also provided me with a great sense of gratitude and clarity. I continue to realize how lucky I am and know that I wouldn’t be here if it weren’t for my amazing support system of family, friends, and doctors. Together, amazing things can be accomplished. Together, we can make a difference in the lives of others. To date Team Chris has raised $4,123. I feel strongly that if we bind together, we can be the loud voice that blows the cover of the silent killer. I’m very much looking forward to Team Chris’s involvement in Boston Heart Walk for many years to come. The American Heart Association has a slogan, “Life is Why”. They encourage their supporters and community team members to choose their why. The first word that came to my mind was “longevity.” Through further exploration of the word, some pretty amazing revelations presented themselves. As defined by dictionary.com, longevity is a noun that means “a long individual life; great duration of individual life.” In my head, I always associated the word as only being marked by a length of time. As stated in the definition above, the word that stuck out to me was “individual”. Looking back now, I believe my true sense of individuality really started to develop on October 5th, 2007. Time may not heal all wounds but time affords us the opportunity to rethink our individual purpose and position in life. A traumatic illness shouldn’t be viewed as roadblock but rather an opportunity to identify what’s most important to you as an individual and what it would mean to live a prosperous and fruitful life. From the bottom of my heart, I truly appreciate all of the love and support everyone has given me for the last twelve years.